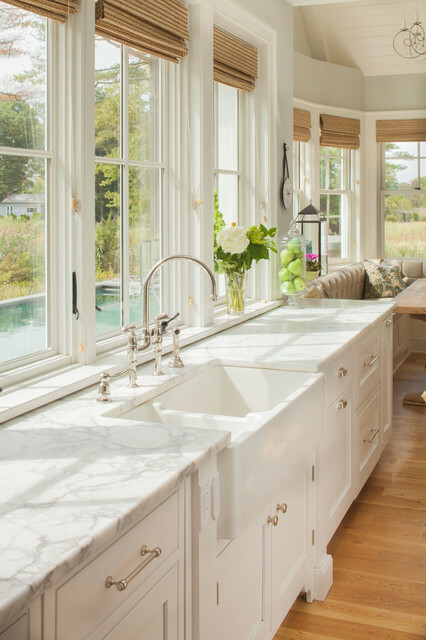 Watch this happy client’s testimonial on how Connecticut Stone transformed her existing kitchen into a bright, beautiful and functional space.Featuring Calacatta Gold Marble and Carrara Marble. pulls - what pulls did you use? Century Hardware offers a wide selection of quality cabinet hardware. The dull satin nickel finish of this cup pull provides an elegant and modern look. This cup pull has a simple style with refined detail that looks great and feels good in your hand when used. This pull is a great, functional accent on your cabinets. RH Lugano in polished nickel. No sealer cannot prevent etching. None. If anyone says it does, it's simply not the truth. It's just the makeup of the stone that causes the vulnerability. So if you don't like water marks, forget marble. Do quartz (human-made, but cant take heat) or better yet, quartzite. Be careful though, a lot of people will tell you some "quartzite" are in fact true quartzite but really they are dolomitic marble. Do your homework before you purchase any counter material! engineered stone - Quartz is an excellent and cost effective alternative to the natural stones - granite, marble, quartzite. Cambria and Viatera are both manufactured in the US and have a variety of marble like slabs which are durable, stain resistant, and hygienic as well as offering warranties for the materials. Faucet - Love the faucet- can you provide me with the source? These windows are gorgeous! Can you please share information on them! They appear to be about 4' tall, but they will do a large range of custom sizing for you as well. Roman shades - Do you know the type and where to buy the Roman shades shown here? Are they bamboo? I would also like information on the shades. The shades are bamboo and purchased at either Lowes or Pier One. 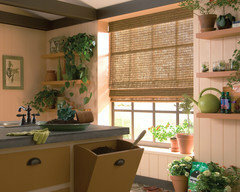 Hunter Douglas also sells a similar bamboo shade. Beautiful! - Do you remember who makes the kitchen faucet? You will be able find detail information about this style of pull-down faucet Item# 2201CP and the bar sink faucet in the video Item# K2005-CP-PVD, as well as other selections from our website. What type of blinds? - Do you know the name or place to purchase the brown window cover? They could also be Hunter Douglas Provenance Woven Wood Shades. They could be purchased at any local Hunter Douglas Gallery dealer. What is the name of the sink and where can I get it? Kitchen counter - Cost ? Does this counter stain easily? Hello! Marble is a softer, more porous stone that can be susceptible to staining if not sealed properly. At CTS, it is common practice to apply an impregnating sealer after installation to prevent staining and etching. Stain-Proof and Meta Cream are two impregnating products that we confidently stand by for protection. We also recommend using trivets, coasters and cutting boards as an extra layer of defense. Take a peek at our VLOG titled "Stain, Stain, Go Away"http://www.connecticutstone.com/education/video-blog-episode-1-stain-stain-go-away/ It's an educational, time lapse video that gives examples of what everyday, household items can do to natural stone when not sealed properly. Was this helpful? Hi! Thank you for your question. The kitchen faucet is Perrin and Rowe Bridge Kitchen Faucet with sidespray in Polished Nickel. It looks like fireclay which is a unique material, learn all about fireclay sinks in this rundown on the pros, cons, maintenance, etc. Hardware - What brand is the cabinet hardware by? Your kitchen is beautiful. I love the exposed hinges. I'm in the process of designing my kitchen and I'm so confused about hardware. Is your hardware chrome or something else? Kitchen countertops - How much is this marble per square foot? Thank you for your question. Calacatta marble ranges in price depending on the market price of the actual slabs you are purchasing. For quality material, you can expect to pay between $150 and $250 SF fabricated. If you are working on a project, and would like an estimate, we'd be happy to help! Please call us at 203-882-1000. Pulls? - Hello! I was wondering what the name of the type of pulls you guys used here in the kitchen? Thanks so much! Sure, they are Lugarno Polished nickel from Restoration Hardware. Are these the 6 or 8 inch? What is the edge detail (profile) on the countertop? - Hello there, Could you please advise the edge detail of the countertop (ie Half bullnose or Pencil round) Thank you. This looks like a double eased edge. Hello Robin Boothe! It is a custom fabrication marble countertop. We can do the same countertop if you are interested in this kind of look. We have a wide selection of marble slabs available, such as Bianco Carrera (White Carrara), Bianco Dolomiti (White Dolomite), Bardiglio Gray, Nero Marquina Black, White Onyx and Crema Marfil. Thanks for reaching out with your question. We made this counter in Calacatta Honed Marble, 1-1/4" thick. Calacatta is a luxury marble that is quarried in Italy. There are many different types of Calacatta available in today's market. Quoting a price without seeing the scope of work is difficult as there are many factors to consider including material type, slab size and waste. In order to quote you an accurate price, we would need to review your project's scope. However, it may be helpful for you to know that presently, Calacatta slabs (in New England) are running between $90 and $200 SF. If you would like a price estimate on your project, please feel free to email us at tyra@connecticutstone.com. Thanks very much! Counter tops - What type of counter top is this and what's the cost? Hello Lyndsay Gilbert! The kitchen countertop is made of Calacatta marble. We can do the similar countertop if you are interested in it. We also have a wide selection of marble slabs available, such as Bianco Carrera (White Carrara), Bianco Dolomiti (White Dolomite), Bardiglio Gray, Nero Marquina Black, White Onyx and Crema Marfil. Hi Lyndsay, Thanks for reaching out with your question. We made this counter in Calacatta Honed Marble, 1-1/4" thick. Calacatta is a luxury marble that is quarried in Italy. There are many different types of Calacatta available in today's market. Quoting a price without seeing the scope of work is difficult as there are many factors to consider including material type, slab size and waste. In order to quote you an accurate price, we would need to review your project's scope. However, it may be helpful for you to know that presently, Calacatta slabs (in New England) are running between $90 and $200 SF. If you would like a price estimate on your project, please feel free to email us at tyra@connecticutstone.com. Thanks very much! Hi Shelley, Thanks for your inquiry. Unfortunately, we do not supply faucets so I do not know what brand the client used. We made the counters! Good luck with your project. What kind of flooring is this and what is it stained/sealed with? Thank you for answering, Jen! The floors are beautiful. I LOVE this faucet. Where might I find one for purchase? According to the designer, the kitchen faucet is Perrin and Rowe Bridge Kitchen Faucet with sidespray in Polished Nickel. What brand is the cabinents? What is the sink that you used? The sink is from Signature Hardware. It is the 39" wide Risinger double bowl fireclay sink. Sandy - Your cabinet hardware looks like it's Lugarno, from Restoration Hardware. Since RH doesn't make appliance pulls, or pulls larger than 8",what did you use for your refrigerator handle? Please tell me what hardware you used for your appliance pulls. The closest man made quartz counter is Caesarstone's Calacatta Nuvo. Who makes the sink, where can you find it? Thanks! The material is fireclay, you can learn all about fireclay sinks in this rundown on the pros, cons, maintenance, etc. 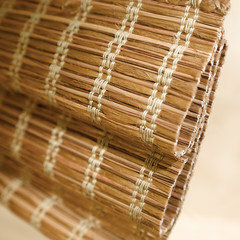 Do you remember the brand and color of the woven wood blinds? Marble - Where did you get the marble, who is the manufacturer? Hi and thank you for your question. This marble is from Italy. We imported and manufactured the job for a customer here in Connecticut. Please let us know if we can of service to you on your project. What is the closest stone that looks like marble - What is the closest stone that looks most like he marble?? Hi, this stone is Calacatta Marble. If you are inquiring about the closest synthetic materail resembling this stone, then it is One Quartz Calacatta by Dal. How much? - How much is the marble? Calacatta marble ranges in price depending on the type and quality you purchase. On average, the material runs $150 to $225 SF. is the counter top Quartz? color and company? Hi and thank you for your email. This material is Calacatta Gold marble by CT Stone. Size of Knobs and Pulls - Please can you tell me the size of these RH knobs and pulls? Thank you! Hi Gillr52 - we are not sure of the size (as we provided the stone for the project), but our client purchased the knobs and pulls from Restoration Hardware in a polished nickel finish. I'm sure if you asked RH, they would be able to provide more detailed specs, such as the size. Thank you for your question. Calacatta marble ranges in price depending on the market price of the actual slabs you are purchasing. For quality material, you can expect to pay between $150 and $250 SF fabricated. If you are working on a project and would like an accurate estimate, please reach out to us at (203) 882-1000. Thank you. Pull handles? - What brand? Is it RH? Yes, they are Lugarno Polished nickel from Restoration Hardware. Our new kitchen counters - How much does this granite typically run? Hi Emily, Yes this is a natural stone. It is Calacatta Marble. How much for WHAT tile? Marble in the kitchen - I've heard that marble stains with acids like lemon, or whiskey, so is it really a good idea to use it at the kitchen? Where to purchase sink? - Hello! I'd love to know where you can get this sink. Calacatta slabs (in New England) are running between $90 and $200 SF. If you would like a price estimate on your project, please feel free to email us at tyra@connecticutstone.com. Thanks very much! Kitchen remodel - Does this marble stain in the kitchen? Hello! Marble is a softer, more porous stone that can be susceptible to staining if not sealed properly. At CTS, it is common practice to apply an impregnating sealer after installation to prevent staining and etching. Stain-Proof and Meta Cream are two impregnating products that we confidently stand by for protection. We also recommend using trivets, coasters and cutting boards as an extra layer of defense. Take a peek at our VLOG titled "Stain, Stain, Go Away" http://www.connecticutstone.com/education/video-blog-episode-1-stain-stain-go-away/ It's an educational, time lapse video that gives examples of what everyday, household items can do to natural stone when not sealed properly. Was this helpful? What is this countertop, please? Lovely! - Thanks! This material is Calacatta Gold Honed marble. Thank you! We like it too! Hello! Do you have any additional pictures of this kitchen? - I'd love to see the full layout. Thanks! The island pendant lights are from Restoration Hardware. They are the Benson pendant in Polished Nickel. Island size - Hello, for a 13' x 20' kitchen, with walls along the long sides, cabinets on one side of the long wall, is a 40" x 10' island too big? Thank you. Hi Bailing, without seeing a drawing of your kitchen layout, its a little hard to say if a 40" x10' island is too large for your kitchen. Certainly at that length it will dominate your space. We thought we might pose some questions to you to help think about whether the island size and kitchen layout work for you and the way you use your kitchen. Do you have enough room around the island to comfortably open cabinets, ovens, dishwashers, etc? When someone is cooking, how will other people circulate around the kitchen/ interact with the cook? What is the "program" of the island? Is there a sink or a stove top on the island? and how much room do you need on each side of that? How much seating do you want around the island? And how much storage? Is the kitchen open to another room or bounded by walls? If you can- we often suggest that clients layout the kitchen with blue tape on the floor (and sometimes even cardboard) to mock up the space and get a feel for what it will really be like. Drawings and photos can sometimes be deceiving- there is nothing like actually having something physical to respond to. I love your pulls and knobs. Do you know where they are from? Thanks! Marble Countertops - Hello! How durable are the marble countertops? 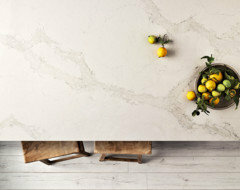 I am considering using marble in our kitchen but have been told they stain easy and aren't as durable as granite. Any advice? Hi there! Congratulations on your kitchen renovation! I am asked this question every day and what I have learned is that it depends on the owner's expectations of the countertop. Is marble durable? Yes. However, marble is not as durable as granite or man-made quartz. Marble will etch from products like vinegar, alcohol and citric acid. When we sell a marble countertop, we sell it with the expectation that it will need to be honed and sealed periodically. The frequency depends on how much abuse the counter takes and also the owner's tolerance toward etch marks. Are the counter tops marble? These counters are indeed marble. The material is called Calacatta Gold and it is featured here in a honed finish. Are you considering marble counters in your project? Lamps - Beautiful kitchen! Where did you buy the chrome lamps? Thank you. The pendants over the island are actually Polished Nickel and they are from Restoration Hardware. Practical question - Does water or food get caught between the counter top and window sill? I guess you could bring the sill completely flush onto the countertop and caulk if you are concerned about it. I didn't do that and I never have had a problem with water or food getting in between. What color is the paint used in this kitchen? - What color is the paint? Outlets - Beautiful! Are there outlets on the window wall? Where are they placed? Thanks! LOVE this kitchen - PLEASE tell me the color of your cabinets. Cabinets: what color are they? - What color is used on the cabinets? Do you know the size of these windows? Where can I find the drawer pulls? - I love the robust look of the bar on the drawers - who manufactures them? How did you hide the electrical outlets on the wall of windows - above the sink? It's gorgeous! Room and banquette dimensions - Can you please provide dimensions for the room, including the banquette, and then provide the dimension of the banquette. I LOVE the design but I'm worried my space is too small. Thank you in advance for your help. Shades - I would love to find these exact shades - purchase information please? Beautiful room! Height of ceiling and Windows - Would you be able to tell me the height of the ceilings and windows? Thank you! Durability and resistance to heat - How durable? How resistance to heat, how do I handle this material? Whats the square foot price? Cabinet colot - What color are these cabinets? 3. Cool counters. Taking the kitchen windowsills to just above the counter is a great detail. It will open up the room by providing a wonderful expansiveness. And while some will say that placing the windowsill so low will create a place for dirt and water to hide, just remember that, like a child, a beautiful room needs attention to stay that way. Surely the coolness of the stone counter warmed by the sun streaming into the windows and the generous views to the outdoors will be worth it. Stunning kitchen extension in Bromley.